Join Linda Tucker, world-renowned author and conservationist, for a number of exciting events—presentations, book signings, and fundraising events around the United States and the United Kingdom, May 18-June 26, 2013. 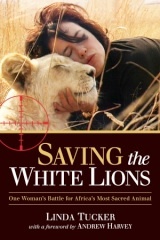 Click on the PDF link below for more information about Linda Tucker and her new book, Saving the White Lions, scheduled to be released on May 7, 2013. Please note, some events are to be confirmed. June 16, 2013 Baltimore, MD/ Washington, D.C.